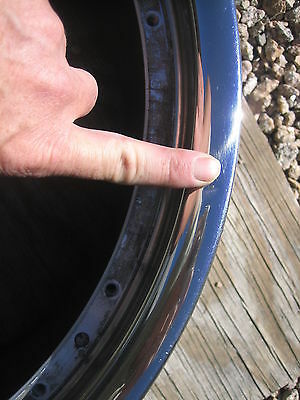 If you are looking at this advertisement, you are aware that the trim ring for 20" XKR BBS styled wheels: Detroit, Montreal, Sepang, and Perseus ... are approximately $299 to purchase, but require breaking the wheel apart (the 2 sections), removal of the old trim ring, installation of a specialized BBS adhesive, re-installation of the new trim ring, and then re-assembly of the 2 parts of the wheel. 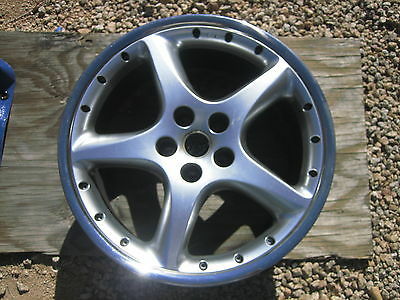 I have a set of 4 BBS Detroit wheels, which had 2 wheels that had scuffs in the trim ring (it is so easy to do)... but 2 wheels with trim rings that appeared really good. This one is almost perfect. That said, it does have a very very very slight, and I mean slight, crease that measures less than 2mm. You may not even be able to see it in the photo (of me pointing to it)... it is that small. 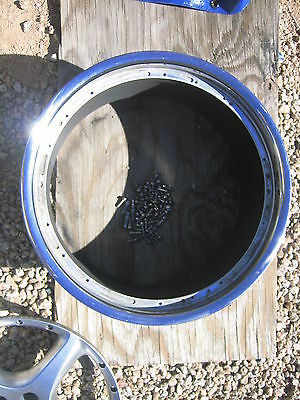 I knew I wanted to have the wheels refinished, and at that time, the only option was to purchase the trim ring from Europe at $299. 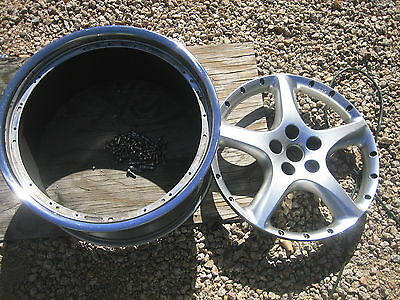 So, instead, I am going to have the wheels specially powdercoated. I thought to remove the good trim rings, and sell them, but taking one of the scuffed trim rings off, it is 'glued' on so well that one cannot help but destroy the trim ring. So... if anyone would like an inexpensive alternative to having them fixed, I will EXCHANGE this wheel... for a your wheel that is scuffed. (PLEASE email if your wheel is more than scuffed. I will not accept a damaged rim). This is for the FRONT wheel, which measures 20x9. You send your FRONT wheel (I will even separate the wheel center for you - it requires a 'special' BBS torque styled socket which is expensive), and I will put your center (Detroit, Montreal, Sepang or Perseus) center back on my wheel which has the excellent trim ring, and then send it back to you. If you are interested in the other wheel... it is a REAR wheel 20x10 and only has the adhesive coming off and the trim ring is warped there. It could likely be fixed... I don't know. I will only service this exchange in the United States... sorry if you are a Jaguar enthusiast in another country.